What is Community Business Weekend and how can I take part? The best way to understand what a community business is, how it works, and how to get involved, is by visiting one. That’s why in 2016, Power to Change, the independent trust that supports community businesses in England, ran the first ever Community Business Weekend, where we encouraged community businesses to organise events over the same weekend for local people to come and find out about what they do. We ended up with about 50 community businesses registered, and when we ran it again last year, 228 took part and nearly 12,000 people saw behind the scenes, understood how they could get involved in running a business for community good and have a say in local decision making by attending one of the 151 events across England. 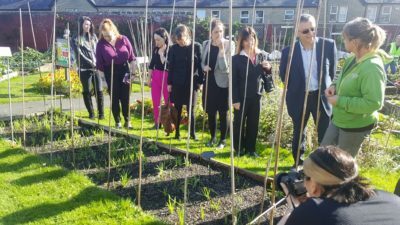 Last year, Community Business Weekend saw people trying out volunteering at a community-run vineyard, a mass community breakfast in an inner-city park and a community pub launch a new beer and explain how they are tackling social isolation. The campaign helped community businesses recruit 226 new volunteers, trustees and shareholders. Anyone who registers to host an event receives free resources, including an organiser pack, telephone support from our campaign team, template marketing materials, PR guidance, webinars and general exposure of their enterprise. And the first 100 community businesses to list their event on the website will receive free bunting! If you have an idea for a community business or think it could tackle a local need, this is a great opportunity to float your vision with people in your local area. You could host a pop-up discussion over tea and biscuits or a full-on consultation event with bells and whistles. If you have community businesses in your area, this could be an opportunity to expand that support even further, whether that be recruiting new volunteers or making and strengthening links with local politicians. 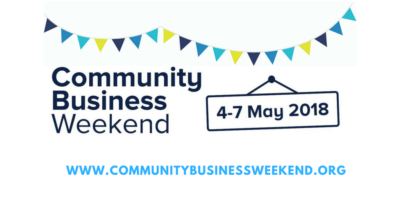 If you want to find out more about community business, and learn a bit more about the model, Community Business Weekend is the perfect time to visit community businesses around you and ask all those burning questions. Whichever way you decide to take part, you’ll help celebrate community business and how they give local power to local people.